Healthy changes are afoot, but can you get there by foot? There are big plans in the works for Fresh Garden Market, a small neighborhood grocer located in the Mt. Hope neighborhood of Southeastern San Diego. 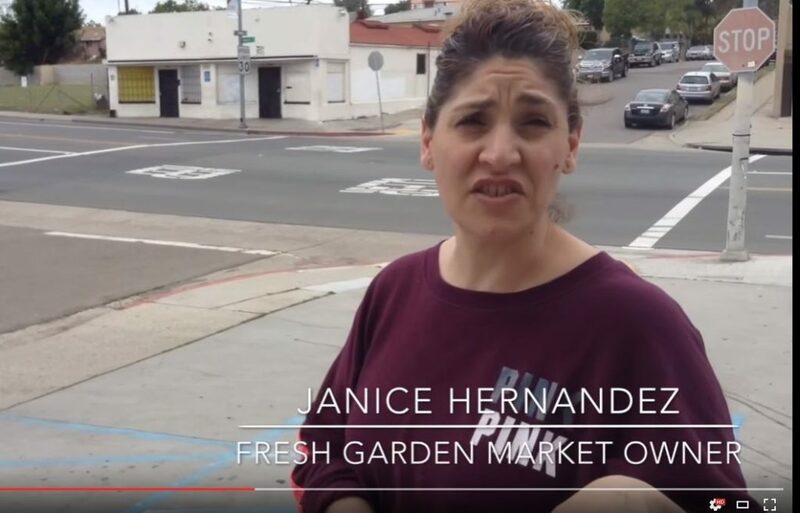 Market owners Janice and Ricardo Hernandez are working with several partners, including our Healthy Retail Program, to revitalize their market as a brand new healthy place to shop for local residents. The market will get an exterior face-lift and interior redesign, however all this work won’t matter if residents can’t safely get to the market. We’re currently advocating to the City of San Diego to fund a crosswalk at the intersection of Market St. and Denby. Watch the video to learn more and find out how to support this project! Project New Village operates the People’s Produce Project at the Mt. Hope Community Garden adjacent to the market. Check them both out to see how this area is becoming a Good Food District!